The global engineering software market depicts the presence of a highly aggressive and fragmented vendor landscape, mainly due to the existence of innumerable players, says Transparency Market Research on the basis of a recently published report. A humungous rivalry mainly exists at an international level. However, several local players are fast gaining ground in this market, thereby giving a tough time to the international businesses, in terms of marketing their products and services. With the number of players expected to increase during the next few years, the global engineering software market is prophesized to depict a rapidly charged-up competitive landscape. Most businesses in the global engineering software market are focusing on expanding product portfolios, coupled with providing technologically advanced offers. Achieving cost regulation, improving geographical reach, and bringing forth innovative concepts are a few other domains where companies are attempting to gain a competitive edge over their rivals. Synopsys, Inc., Bentley Systems, Inc., Autodesk, Inc., PTC, Inc., Ansys, Inc., Geometric Ltd., Dassault Systemes S.A., Siemens PLM Software, Inc., IBM Corporation, SAP SE, Synopsys, Inc., and MSC Software Corporation, are key players operating in the global engineering software market. As per experts, the global engineering software market is expected to grow at stellar CAGR of 12.4% during the forecast period from 2015 to 2022. This market registered a splendid revenue of US$19.98 bn in 2014, which is expected to grow further during the said tenure. A rising need for automation and demand for automation of integrated solutions in order to facilitate quality designing and analysis of engineering systems in a plethora of applications is majorly driving the global engineering software market. Moreover, with a rapidly expanding industry where cloud engineering is utilized on a vast scale, this market is progressing at a fast pace in recent times. Electronic devices such as smartphones, tablets, and laptops are penetrating most regions all over the globe, which is further expected to boost the global engineering market’s growth. This is mainly due to an extensive use of the software services in these devices, which form an integral part of their functioning. Demand for industrial automation is likely to fuel growth in the global engineering software market. Lastly, engineering software services are in high demand in the domains of architectural mapping, 3D printing, construction, and other similar fields. And as each of these sectors is witnessing a significant boom currently, the global engineering software market is expected to expand tremendously during the next few years. However, high maintenance costs and license costs might make the end product substantially expense, thus discoursing those having less disposable income from not purchasing it. This is a major factor hindering the global engineering software market. Moreover, lack of technical expertise in operating the engineering software products in remote and underdeveloped regions too is stunting the market’s progress gradually. However, many companies are expected to introduce several cost-effective products and services in the near future. 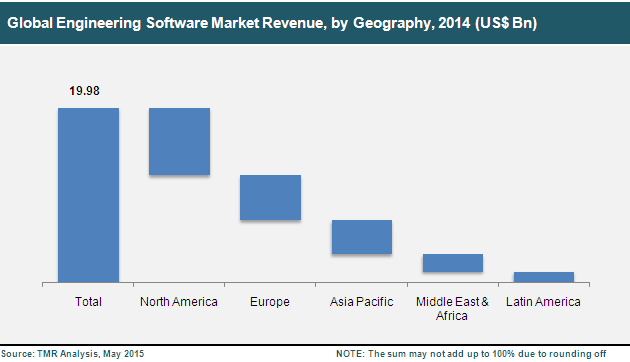 This could reduce effects of the restraints affecting the global engineering software market. The information shared that has been in this review is based on a TMR report titled, “Engineering Software (CAD, CAM, CAE, AEC, & EDA) Market - Global Industry Analysis, Size, Share, Growth, Trends and Forecast 2014 - 2022”. A rising need for automation and demand for automation of integrated solutions in order to facilitate quality designing and analysis of engineering systems in a plethora of applications is majorly driving the global engineering software market. With the number of players expected to increase during the next few years, the global engineering software market is prophesized to depict a rapidly charged-up competitive landscape.